Mongolia is landlocked between China and Russia. With 1,566,500 square kilometers, it is three times as large as France. Mongolia covers about 2400 km from west to east and about 1260 km from north to south. Mongolia is a vast mountainous plateau sloping from west to east, 80% of spaces are above 1000 meters altitude. 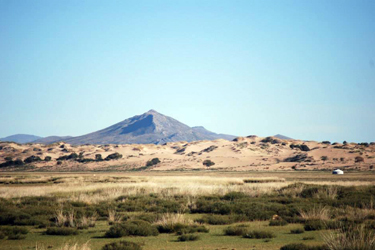 Its terrain consists of mountains and rolling plateaus. The west and north are occupied by the Altai Mountains, and the altitude decreases progressively towards the plains and depressions in the South and East. The average altitude of Mongolia is 1580 meters. The lowest point is Lake Huhk, at 560 meters, and the highest mountain is the Huiten Peak in the Altai Mountains(4374 m). The capital, Ulaanbaatar, lies at 1,350 meters. Mongolia has three major mountain ranges. The highest one, the Altai Mountains, spred from the west to the south-west. The main peaks are concentrated in this region, with an average altitude over 2000 m. Some peaks are covered with glaciers. 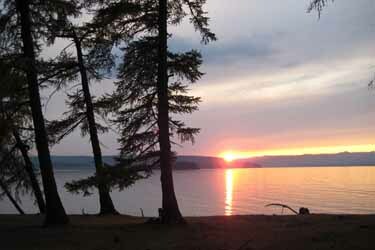 The Khangai Mountains, more ancient and with lower altitude, are covered with forests and alpine pastures. They occupy much of central and north Mongolia. The Khentii Mountains (Mongolian Khentiin Nuruu), northeast of Ulaanbaatar, near the Russian border, are even lower. Mongolia is dotted with hundreds of lakes, the largest being Lake Uvs (covering an area of ​​3,350 square kilometers), Lake Khovsgol (2.620 km ²) and Lake Khar Us (1.852 km ²). 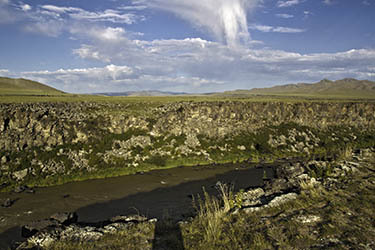 The Orkhon (1124 km), the Kherlen (1090 km) and the Selenge (539 km) are the largest rivers. 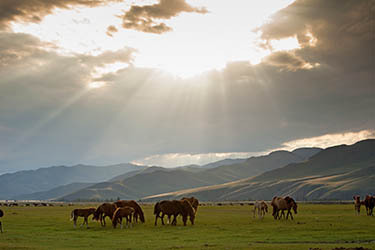 Mongolia's geography is characterized by great diversity. From north to south, it can be divided into four zones: the mountain forest, the alpine steppe and in the far south the semi-desert and the desert (the desert is about 30% of the total territory). The mountains and dense forests predominate central and northern Mongolia and grasslands cover large areas of this region. 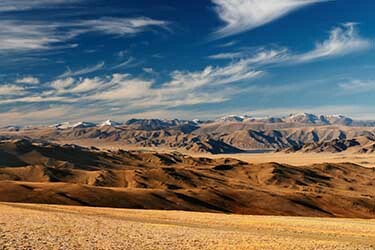 The eastern part of the country is covered by vast expanses of the Asian steppe. The steppe is increasingly blurred in the Gobi Desert, which extends into southern Mongolia from East to West. The Gobi desert is composed primarily of rock and cliffs, but it also contains sand dunes in arid regions near the southern border. It covers about one third of the surface of Mongolia, and was on the way of the Silk Road.